Wait that's not why you care about this. 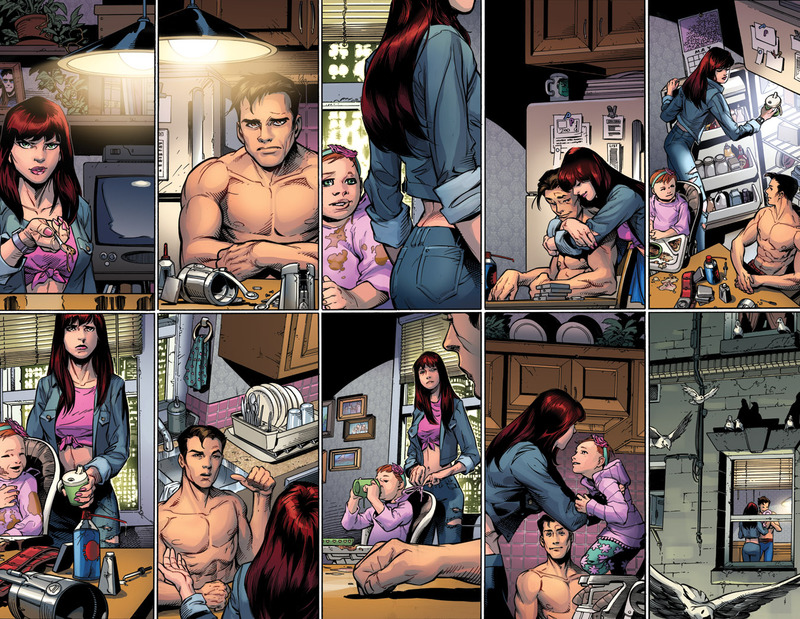 You want to see why and how Peter Parker is back with MJ and who their daughter is. This story provides everything that critics of Brand New Day said could have been. We have a mature Spider-Man a mature Peter Parker who has had to grow up. He is willing to make tougher decisions and greater sacrifices. 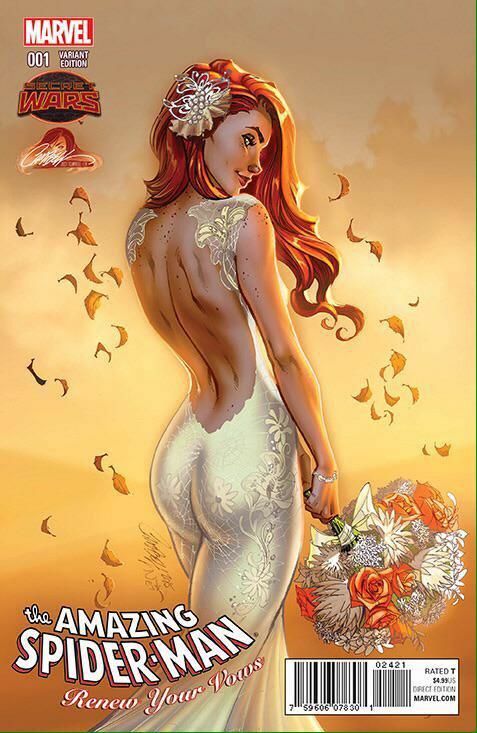 The story is also weakened by some of the same worries that were reasons for ending Spider-Man's marriage in the first place. He now has a nagging wife and a kid who seem to consume his time and focus. Not only does he not have an array of girl friends but he also barely has time for the Avengers. Barely anytime to be Spider-Man, and after all we read Spider-Man to see Spider-Man. Is that a black suit? This books is this strange ode to what could have been, both the good, and the bad. In the end I batted around grades as low as 6 and as high as 9. I mulled it over and decided to cut the difference. Like all stories this one will largely effect you based off who you are. If you grew up reading Peter Parker's exploits in the 80s or 90s then this is a story for you. My guess is that you too have grown up, and in this story we see our champion growing up as well. The book though feels like the early 90s so much. The look of the art, the dialog and even the primary villain that shows up. If you read Spidey in the 90s you already know who it is. This books is soooo early 90s that some how Nirvana Smells Teen Spirit just magically popped into this review! No Kidding look there it is........BAM! O' and you also get to learn about the Battleworld zone called the Regency if that is burning up your brain. While I jested earlier about the Regency lets be clear the idea behind it is kind of cool, and very provocative in terms of its dynamic with Peter Parker. The story begins in a world that seems to have the general dynamic of the Marvel universe in the late 90s if Brand New Day never happened. Parker finds himself staying out later than usual battling bad guys, much to the chagrin of his wife. The reason for this turns out that many heroes have disappeared. Daredevil, Iron Fist, and Night Thrasher have all gone missing, as have the entire X-Men team. Spider-Man convenes with the Avengers who learn of a villain who has been studying means of absorbing powers. Needless to say this villain calls himself the Regent and gives this realm of Battleworld its name. In preview art it appears she has powers of her own and knows how to use them. She does seem like a version of Mayday. Not even The Amazing Spider-Man is safe from Secret Wars! In this new Marvel Universe, Peter Parker, Mary Jane Watson and their daughter have to scrape by to make ends meet, but they have each other… Face front, True Believers. This is the one you’ve been asking for.